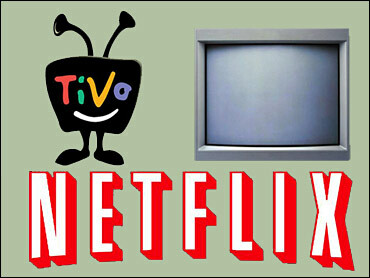 Home entertainment trendsetters Netflix Inc. and TiVo Inc. hope to link up on a service that will use high-speed Internet connections to pipe DVD-quality movies into the homes of their mutual subscribers. The recently drooping stocks of both companies perked up Tuesday as investors embraced the prospect of an alliance between two pioneers that have changed the way millions of households rent DVDs and watch television. Los Gatos-based Netflix has attracted 2.1 million subscribers to its $21.99-per-month service, which mails up to three DVDs at a time after customers place their orders on the Internet. The service, which draws upon Netflix's library of 25,000 DVD titles, doesn't charge late rental fees -- a concept that has forced video rental giant Blockbuster Entertainment to change its ways. Alviso-based TiVo makes digital video recorders that let viewers easily record TV shows onto hard disks, skip commercials and pause live broadcasts. About 1.9 million subscribers pay a $12.95 monthly fee for TiVo's service, which has inspired a variety of clones. Neither Netflix nor TiVo would provide details about their possible movie-on-demand service nor even assure that the discussions reported by Newsweek magazine would come to fruition. "`It makes sense to be brainstorming with TiVo right now, but there is no relationship right now or a timeline for creating one,"' said Netflix spokeswoman Lynn Brinton. TiVo spokeswoman Kathryn Kelly issued a similar statement. The companies already share a common bond -- TiVo CEO Michael Ramsay been on Netflix's board of directors since May 2002. But the overlap between the households that subscribe to both Netflix and TiVo is "minimal," something that makes it unlikely the partnership will be a financial boon for the companies, according to a report issued Tuesday by Friedman, Billings, Ramsey & Co. analyst Alan Bezoza. Netflix and TiVo haven't publicly disclosed how many subscribers they share. Citing unidentified sources close to the negotiations, Newsweek reported that the partnership could be announced before the end of this month, pending approval of TiVo's board of directors. TiVo's board is scheduled to meet Thursday. Even if a partnership is formed soon, the movie-on-demand service probably wouldn't be available for at least another year. The service could face several obstacles, including legal resistance from movie studios, which worry that Internet distribution could make it easier for pirates to make and sell illegal copies. Netflix and TiVo also will have to persuade consumers the quality and convenience of movies delivered over the Internet justifies spending hours to download the video. Finally, Netflix and TiVo may find themselves playing catch-up with several existing Internet-based services operated by CinemaNow, MovieLink, Starz Encore and Akimbo Systems Inc.
Wall Street didn't seemed concerned with the looming hurdles Tuesday as Netflix's shares climbed $1.05, or 7 percent, to close at $15.41 on the Nasdaq Stock Market, where TiVo's shares gained 66 cents, or 15 percent, to $5.08. The investor enthusiasm largely reflects the two companies' track record for innovation, said Sean Badding, a digital entertainment analyst for The Carmel Group. "There haven't been too many companies that have come up with more disruptive technologies than Netflix and TiVo during the last five years," Badding said. "They have become the best-of-breed services in their respective markets." But inroads made by Netflix and TiVo have inspired competitive threats that have raised concerns that the two companies eventually will be bumped aside by larger rivals with deeper pockets. Both Wal-Mart Stores Inc. and Blockbuster Entertainment are trying to topple Netflix with their own online DVD rental services, while cable TV giants have introduced digital video recorders that offer services similar to TiVo's. Hoping to broaden his service's appeal, Netflix CEO Reed Hastings earlier this year vowed to begin exploring ways to allow the company's subscribers to download movies over the Internet. Hastings has emphasized that the downloading service probably wouldn't produce much revenue during the next year or two, but he expects it to become a big business within the next decade.